The Americas produces most chicken but its global share is declining, says industry analyst, Terry Evans, in his latest view of trends in poultry meat production in the region. In 2015, world chicken meat (table birds plus culled layers) production looks likely to exceed 97 million tonnes, notching up a gain of 2.0 per cent on the previous year. In broad terms, chicken meat represents around 88 per cent of total poultry meat output. Forecasts to 2023 by the Organisation for Economic Co-operation and Development (OECD) and the Food and Agriculture Organisation (FAO) point to poultry meat production expanding by some 2.3 per cent per year as output climbs from 107 million tonnes in 2013 to around 134.5 million tonnes in 2023, by which time chicken production will total around 118 million tonnes. A major problem in forecasting chicken meat production in recent years has been arriving at an estimate of output in China. The FAO considers that poultry meat production in China declined by nearly five per cent in 2014 as a result of the effects of avian flu on the demand for chicken and on the availability of live birds for direct consumption, hence chicken meat output looks to have declined to around 12.5 million tonnes. However, estimates by the USDA point to a cut-back in broiler production in China of only 2.6 per cent at 13 million tonnes, a level which is expected to be maintained in 2015. 2014E and 2015F = 5m estimates and forecasts for chicken meat; 2015F = USDA forecasts for broiler meat. 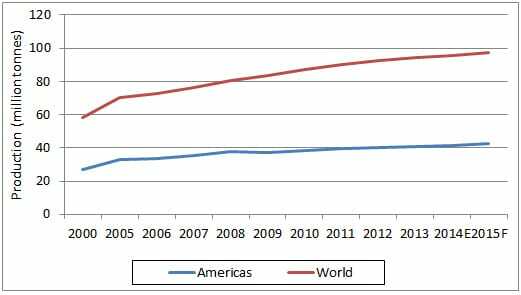 Although the Americas is the largest chicken meat producing region (Table 1), as output has risen from 27 million tonnes in 2000 to an estimated 42.4 million tonnes this year (Figure 1) this region’s proportion of the global total looks to have slipped from 46.3 to 43.6. In the meantime, Asia has expanded its share by around a percentage point from 31.8 per cent to 32.7 per cent, while Europe’s contribution has grown from just below 16 per cent to more than 17 per cent. The USDA estimates world broiler production for selected countries the total having risen from nearly 73 million tonnes back in 2008 to an estimate of 87.4 million tonnes for this year (Table 1). The number of chickens slaughtered in 2012 was almost 60,000 million, of which nearly 21,000 million were killed in the Americas or just 35 per cent. However, the average eviscerated weight per bird in this region was more than 1.9kg compared with the global figure of 1.6kg which is why it accounted for 43 per cent of the world total. Within the Americas, the average eviscerated weight ranged widely from as little as 0.9kg in Haiti, where fewer than nine million birds were slaughtered, to more than 2.4kg in Argentina where 685 million were killed in 2012. Production by the individual countries in the region is presented in Table 2. Clearly the picture is dominated by the US and Brazil as these two accounted from some 28.6 million tonnes or 71.5 per cent of the regional total. The top eight countries combined – which includes Mexico, Argentina, Peru, Columbia, Canada and Venezuela – produced more than 37 million tonnes or 93 per cent total (Tables 2 and 3). The USDA data in Table 4 applies only to broiler production but, unlike the FAO chicken meat figures, they include estimates over the period 2013 to 2015. Figure 2 traces the development of the broiler industries in the top four producing countries in this region from 1990 to 2015. While production in the US has doubled, Mexico’s industry has recorded a three-fold increase. 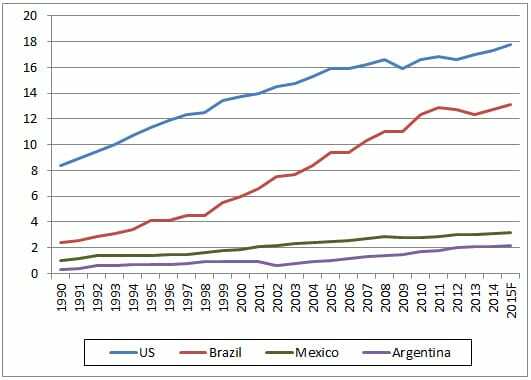 However, the most dramatic developments have been in Brazil and Argentina as they have respectively achieved gains in output of more than five times and seven times the 2000 level. Back in 2000, Canada was the fourth largest producer in the Americas but by 2005, this country had been overtaken by Argentina and in 2009, also by Colombia (Table 4). Lower costs, particularly feed, coupled with a relative shortage of competing meats, have boosted United States broiler producers’ profits such that the latest estimates of production for 2015 of 17.8 million tonnes show a gain of nearly three per cent over 2014, which had recorded an increase of only 1.7 per cent over the previous year. USDA economists postulate an annual average growth rate of just over two per cent per year to 2023 as output climbs towards 21 million tonnes. After a cut-back in production of almost three per cent in 2013, broiler output in Brazil was expected to recover by a similar percentage in 2014 on the back of lower production costs and the prospects of increased exports. As continued strong export demand and lower feed costs are envisaged for 2015, production is expected to continue expanding with forecasts ranging from 13.1 to 13.3 million tonnes. There is, however, some cause for concern that growth may be curtailed by a slow-down in the increase in domestic consumption. According to a USDA International Egg and Poultry Review continued consolidation coupled with improved biosecurity and increased industry investment could expand broiler production in Mexico this year towards a record 3.2 million tonnes. Stimulated by an increasing demand from Russia, the broiler industry in Argentina is expected to produce a record near 2.2 million tonnes in 2015. Production has more than doubled within the past 10 years as a result of rising domestic and foreign demand along with ample feed supplies. A USDA GAIN Report reveals that the Argentinian industry is vertically integrated to a significant degree and has modernised. This has resulted in increased efficiency which has boosted production, some 80 per cent of which is processed in 58 federally-inspected plants. The remaining smaller companies are approved and controlled by provincial authorities to sell only in areas where they are located. Most companies are domestically-owned. Birds for the export market are generally slaughtered at 38 to 40 days, while those destined for the domestic market are killed at 49 to 51 days, yielding an average carcass weight of around 2.2 to 2.4kg. Canada’s industry, which is supply-managed, has recorded steady growth from 2000 to 2014 although the annual average rate has been a modest 1.5 per cent per year. The forecast for 2015 of 1.1 million tonnes points to an increase of less than two per cent, while it is anticipated that future growth is likely to echo this trend. In contrast, the industry in Colombia has recorded an annual rise of a little less than five per cent per year since 2000 enabling it to overtake Canada in the production league table. While the latest official data for Peru is for 2012, industry reports indicate that current production could be around 1.2 million tonnes a year, however, one forecast for as far ahead as 2020 shows only a slight improvement on this figure.